Upper respiratory endoscopy involves placing a flexible camera into the horse’s nasal passages. From the nasal passages, the turbinates of the nose can be assessed and the camera advanced all the way back to the horse’s larynx and pharynx, where the luminal structures can be assessed visually. Structures such as the larynx, vocal cords, guttural pouches, epiglottis and many others can be assessed by this method. The scope can then be placed into the trachea and advanced down to visualise the smaller bronchi. This allows procedures such as a tracheal wash or bronchioalveolar lavage. Upper respiratory endoscopy is performed in a resting patient and allows excellent visualisation of the structures but gives little information about the functional ability and capacity of the larynx and pharynx. Overground endoscopy, or exercise endoscopy, is performed by inserting a firm endoscope into the horse’s nasal passages to sit looking at the pharynx / larynx area. The horse is then exercised, and the data is sent to a computer located underneath the saddle. The video is recorded and can then be played back in slow motion allowing visualisation and assessment of the function of the larynx and pharynx at fast (gallop) exercise. There are numerous conditions which can only be diagnosed during exercise so an overground endoscopy is considered the gold standard for airway diagnostics. Since the advent of overground endoscopy it has been realised that a single respiratory problem rarely occurs in isolation but an overground endoscopy is required to diagnose the other, more subtle but still important, functional abnormalities. 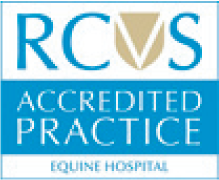 If your horse has an upper respiratory problem or is not performing as expected then please call the practice on 01903 883050 or email info@sussexequinehospital.co.uk To book an appointment.